Lincoln, Neb.—March 7, 2016 — Mortech®, a Zillow® Group business providing mortgage technology solutions for mortgage bankers and secondary market teams, was recently named to HousingWire’s HW TECH100™ list of the housing economy’s most innovative companies for 2016. This marks the third consecutive year in which Mortech has been recognized by the publication for its innovation in mortgage technology solutions, which have streamlined mortgage pricing, secondary desk, online rate quoting, and lead management operations for mortgage lenders across the country. The TECH100™ views innovation through six unique dimensions, with each company’s inclusion on the list being attributed to fitting within them. LINCOLN, Neb.—August 18, 2015 — Mortech®, a Zillow Group business providing mortgage technology solutions for mortgage bankers and secondary market teams, today announced a new integration between Mortech’s product and pricing engine (PPE) and secondary marketing solutions and Ellie Mae’s Encompass® all-in-one mortgage management solution. The new, advanced integration eliminates manual data entry and enables lenders to automate the transfer of detailed loan pricing information from Mortech to Encompass. The integration also provides a feature-rich platform for Mortech to quickly implement pricing functionality enhancements within Encompass as the market changes. Fannie Mae and Freddie Mac have both announced their versions of the new low down payment program as promised earlier by Mel Watt, director of FHFA, the conservator for both agencies. There are many similarities and some differences in the respective Agency’s program. 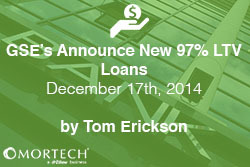 LINCOLN, Neb.—December 2, 2014 — Mortech, a Zillow® business providing mortgage technology software solutions for mortgage bankers and secondary market teams, today announced the integration of mortgage pipeline hedging and risk management leader, MCT Trading, Inc. (MCT) into Mortech’s product and pricing engine, Marksman®. Using MCT’s award-winning real-time trading and best-execution product, MCTliveTM, lenders can now manage hedging, trading, and pipeline risk all in one place. Mortech’s historical pricing feature provides enhanced re-pricing workflow and added compliance security via side-by-side loan scenario comparison. LINCOLN, Neb.—November 18, 2014 — Mortech, a Zillow® business providing mortgage technology software solutions for mortgage bankers and secondary market teams, today announced the availability of historical pricing within their secondary marketing solution. The historical pricing functionality expedites the re-pricing and re-locking process, allowing mortgage lenders to immediately address changes in the lock application. Mortech now provides customized, easy-to-build personal websites for mortgage lenders. LINCOLN, Neb.—October 7, 2014 — Mortech, a Zillow® business providing mortgage technology software solutions for mortgage bankers and secondary market teams, today announced the launch of lender websites, which will allow mortgage lenders to quickly and affordably create a custom WordPress®-powered website for their personal brand and business.